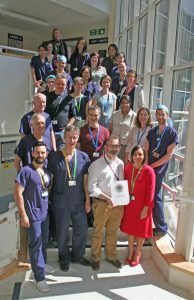 The anaesthetic department at Dorset County Hospital have been recognised for providing the highest quality care to local patients. The hospital received the prestigious Anaesthesia Clinical Services Accreditation (ACSA) from the Royal College of Anaesthetists (RCoA) at a ceremony on 20 April attended by staff, patients and hospital managers. ACSA is the RCoA’s peer-reviewed scheme which promotes quality improvement and the highest standards of anaesthetic service. To receive accreditation, departments are expected to demonstrate a high standard in areas such as patient experience, patient safety and clinical leadership. Dorset County Hospital is the main provider of acute hospital services to a population of approximately 250,000 living within Weymouth, Portland, West Dorset, North Dorset and Purbeck. The hospital’s anaesthetic department is the fifth in the south of England and the nineteenth in the UK to receive the accreditation. Dr Jonathan Chambers, Consultant Anaesthetist and ACSA lead at the Dorset County Hospital, said: “Working through the ACSA process has been a positive experience for our whole department. It has enabled us to ensure that the high quality anaesthetic service developed over many years, by colleagues past and present, remains safe, efficient and patient-centred.